Newcastle manager Alan Pardew hopes the new additions to his squad will help them "restart" their season ahead of Tuesday's crucial game at Aston Villa. The Magpies sit a point ahead of Villa - who themselves are the same distance above Reading in the relegation zone. 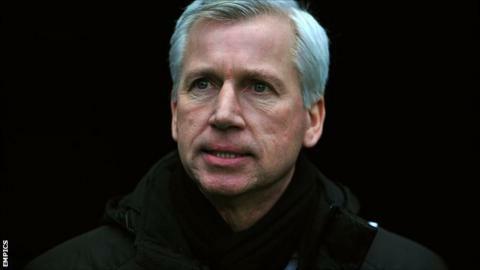 But Pardew has added five new signings in the January transfer window in an attempt to rescue their season. "It's a kind of restart for us because we are so much stronger in terms of depth and quality," said Pardew. The Tynesiders have signed Frenchmen Mathieu Debuchy, Mapou Yanga-Mbiwa, Yoan Gouffran, Massadio Haidara and Moussa Sissoko, the latter four arriving in the space of as many days last week. That flurry of activity, coupled with playmaker Yohan Cabaye's return from injury and the retention of skipper Fabricio Coloccini despite his original wish to return to Argentina, has significantly lifted spirits on Tyneside and Pardew is hoping to see that channelled into a much-improved performance in the Midlands. "We have got Yohan coming back, and he's like a new player," added Pardew. "Debuchy has come into the building and settled quickly, Sylvain Marveaux is playing well, and then the new boys on top of that. "We have had a small squad since I have been here and now for the first time, I think I have the full allocation, and that goes without the injury crisis we have suffered this particular year. "We are up to full strength really and now it is about making sure we get the victories we need to build on this.